I wrote a few posts about SugarCRM some time ago, including ways to play with their SOAP interface to gather and input data. Today we’ll discuss the flexibility of SugarCRM and the way it could nicely fit into an applicant tracking system. In short, almost every aspect of SugarCRM is a module. Leads, opportunities, tasks, projects. All these are modules. SugarCRM comes with a Module Builder and a Studio which not only help you customize your existing modules, but also let you build your own! So basically SugarCRM is flexible enough to become a project management system, a contact management system and a recruitment system. An Applicant Tracking System (ATS) is a software application that enables the electronic handling of recruitment needs. An ATS system can be implemented on an Enterprise or small business level, depending on the needs of the company. ATS systems are very similar to Customer Relationship Management Systems, but are designed for recruitment tracking purposes. I’m not an HR expert so please don’t criticize my scheme too much. But I am using this scheme and I will show you how to implement it in SugarCRM, so before we proceed make sure you have found your Admin panel and fired up the Module Builder and/or Studio. Basically, this is something that could be used already, so if you’d like to check it out, save and deploy your package. Then browse to the Admin panel, hit Configure Tabs and make sure that Positions and Candidates are in the “Displayed Tabs” list. This makes them available system-wide, but does not make them visible to you, as newly created modules are hidden by default. In order to make them visible, browse to your account settings and click Edit, then move the two options to the “Display Tabs” list in your Layout Options. Save and refresh the page, voila! That’s about it. Now our Candidates and Positions are linked via fields and Candidates are also linked to Accounts, but don’t rush to save and deploy. You will not notice any changes in the module, as the new fields that you’ve added are no use if they’re not displayed. New fields are not displayed in modules by default so you’ll have to customize the layouts for Candidates and Positions. So, browse back to your Positions module and hit the View Layouts button. The three essential layouts are EditView, DetailView and ListView. You should customize them all based on your needs and don’t forget to add the new fields to those views. I prefer to keep things simple so I put only the basic stuff in all my views, but you may try different variants to meet your needs. The same should be done for the Candidates module, and once that is complete you should save and deploy your package. Sweet eh? You might wonder where did the History section come from? 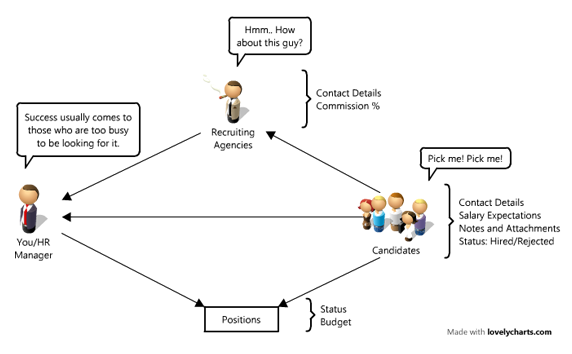 Quite simple, it’s all about relations in SugarCRM. 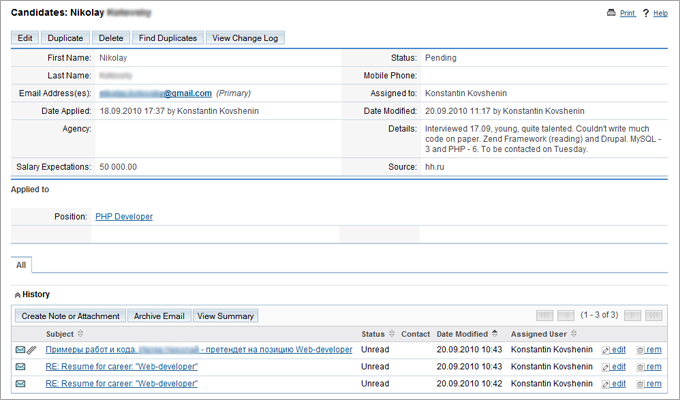 The History and Activities (not visible on screenshot) fit well into the Candidates entity as you’ll probably have e-mails, tasks, meetings and calls attachable to them.